The largest steamboat ever built, the grand American Queen is a gracious and elegant triumph of American ingenuity.Although filled with today�s modern amenities, her rooms and accommodations display all the opulence of the American Victorian era. Glistening woodwork, fresh flowers and antiques adorn her interior spaces. Outside, lacy filigree evokes memories of the many stately river steamers that preceded her and so inspired her designers. While on board, you can select a volume from the vast collection in the Mark Twain Gallery, the boat�s library. Or enjoy a sing-along in the Main Deck Lounge, and then tap your toes to a lavish show in the two-deck-tall Grand Saloon, the most elegant showplace on the river. 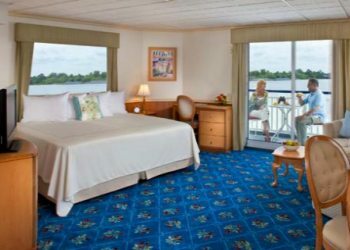 Traveling on the Mighty Mississippi and its tributaries aboard the American Queen, you will be transported back in time, to an era of leisurely and romantic travel. Longer than a football field and towering six decks in height, she is the largest riverboat in the world and a marvel of American engineering. 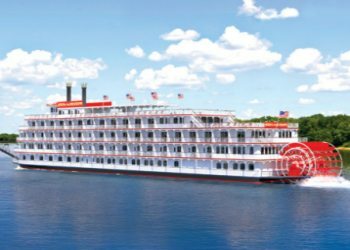 Laced with gingerbread trim, fluted stacks and a giant red paddlewheel, she is a sight to behold. Her interiors are equally magnificent, resplendent in polished mahogany, rich fabrics and Tiffany glass. As opulent as she is, you will find an atmosphere that is warm, welcoming and friendly as her proper southern origins require. Her all-American crew is the epitome of Southern Hospitality and the reason so many of our guests return time and time again. Crewmembers take genuine delight in ensuring that every request is fulfilled and every detail tended to. And with only 432 guests onboard, you will witness something wondrous as your journey progresses. When you choose to share your vacation with us, you will share it with like-minded peers and friendships follow naturally. Along the way, a kaleidoscope of destinations awaits. Storybook American towns and vibrant, bustling cities provide a bit of excitement between peaceful fields of gold and majestic, soaring mountains. Broad sweeping deltas and deep blue fjords are the same visions that compelled the works of Mark Twain. To travel aboard the American Queen is to immerse yourself in extraordinary American experiences, shared only by a discerning few.-the-Mississippi.